The highly efficient fluidizing drying equipment is ideal for drying screw-extruded particles and granules made using different methods. 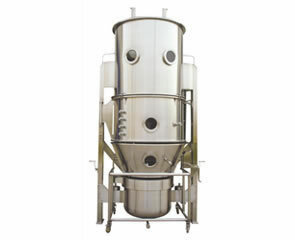 To illustrate, it can be used for drying particles with varied sizes and powder raw material in fields such as pharmaceuticals, foodstuff, feed stuff, chemical industries, and more. Also, the drying equipment can be used for drying giantarum and polyacrylamide materials which may have size variation after drying. Air is purified and heated, then it is introduced from the bottom of an induced-draft fan and passed through the screen plate of raw material. In the working chamber, materials form into fluidized state after stirring and negative pressure effect. The moisture is evaporated and removed rapidly and the raw material is dried quickly. 1. The structure of fluidization bed is round so as to avoid a dead angle. 2. Inside the hopper there is a stirrer to avoid sticking together of raw material. 3. The granule is discharged through the method of turning over, which is very convenient. The discharging system can also be designed according to requirements. 4. It is operated under the conditions of negative pressure and sealed. The air is filtered, so it is simple in operation, convenient and clean. It is also in conformity with the requirements of GMP. 5. The drying speed is quick and the temperature is uniform. In general, the drying time is 15-45 minutes for each batch. 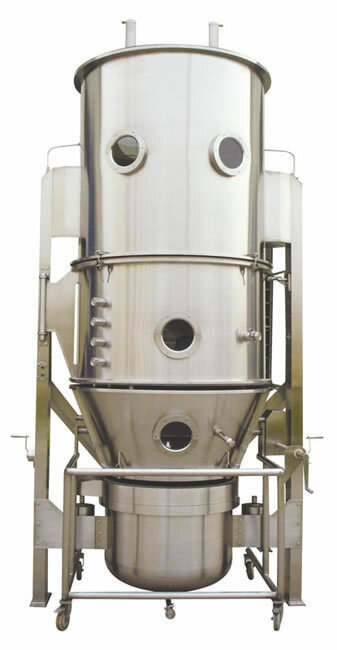 We at Xianfeng Drying are a Chinese manufacturer and supplier specializing in the production of high efficiency fluidizing drying equipment in China. We also offer airstream drying equipment, belt drying equipment, a rotary granulating machine, and more.